Final Fantasy VII for the PlayStation continues Squaresoft's tradition of exciting Role Playing games for home console systems. The development team from the previous games return, including series creator Hironobu Sakaguchi and lead composer Nobuo Uematsu. The characters designed by Tetsuya Nomura feature Cid Highwind, an ex-soldier; Tifa Lockhart, his childhood friend; and Barrett Wallace, leader of a rebellion against the manipulative Shinra, Inc. Along the way, you can recruit up to nine playable characters, each with their own weapons and abilities. This single-player game takes place on pre-rendered backgrounds, though the battles are fully 3D. The game features over 60 hours of play, with a massive main story and numerous side quests to complete. In addition, there are plenty of mini-games, including a snowboarding game and a submarine game. FINAL FANTASY VII also has over an hour of full-motion video scenes that span the game's three discs and pull you into the movie-like environment. 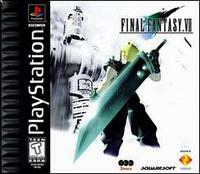 Final Fantasy VII is arguably the best game ever made for any platform. The story is enveloping, gameplay is phenomenal, and the sidequests are never ending. Anyone who plays the Final Fantasy series could tell you this is by far the best that Square has ever released. BUY IT! Great Game, but the description is off. are they located? also how do i defeat the weapons?